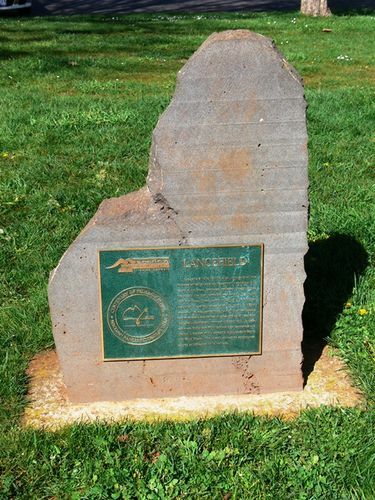 A monument marks the Macedon Ranges Federation Trail at Lancefield. The Macedon Ranges Federation Trail commemorates the centenary of Federation of the Australian Commonwealth in 1901. Lancefield falls in the clan territory of the Wurundjeriballuk and an important Aboriginal site exists in the area. European settlement began during the 1830's, the first township was established in the 1850`s at Deep Creek, north of Lancefield, however, persistent flooding necessitated the move to higher ground. The rich agricultural land supported farming and produced a fine variety of crops and early industries included a malthouse, brewery and flour mill. In 1860, explorers Burke and WIlls camped near Lancefieldd and the site is marked with a memorial stone close to Burke and Wills Track. The town's attractive streetscape affords an indication of its heritage.